Ostermann, Christian F.; Malcolm Byrne. 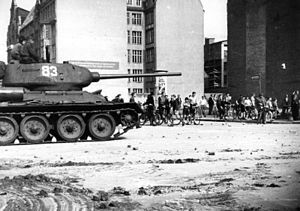 Uprising in East Germany, 1953. Central European University Press. pp. 35–45. Sperber, Jonathan. "17 June 1953: Revisiting a German Revolution" German History (2004) 22#4 pp 619–643. Tusa, Ann . The Last Division: a History of Berlin, 1945-1989. Reading, Massachusetts: Addison-Wesley, 1997. Hope M. Harrison. "Driving the Soviets up the Wall: Soviet-East German Relations, 1953-1961." หน้านี้แก้ไขล่าสุดเมื่อวันที่ 13 ธันวาคม 2561 เวลา 15:37 น.